Yesterday, we gathered in Columbia with allies from across the state to address affordable housing in South Carolina. Professionals from the nonprofit, public, and private sectors spent the day listening, learning, and discussing strategies for advocating for housing equity in our communities. The data makes a case for action. Thanks to municipalities and community partners investing in housing studies across the state, we have a wealth of data which supports what we already know: wage and housing cost disparities are steadily growing. The pressure to change the legislative environment in the State House must come from the ground up. Champions for housing affordability can make an impact when we commit to active engagement with our law makers. Infrastructure will always be critical to the equity in housing discussion. We must invest in the framework that supports affordable housing. The environment we build is linked to the health and well-being of our state. By building equitable, walkable, and livable communities, we help create better lives for residents. 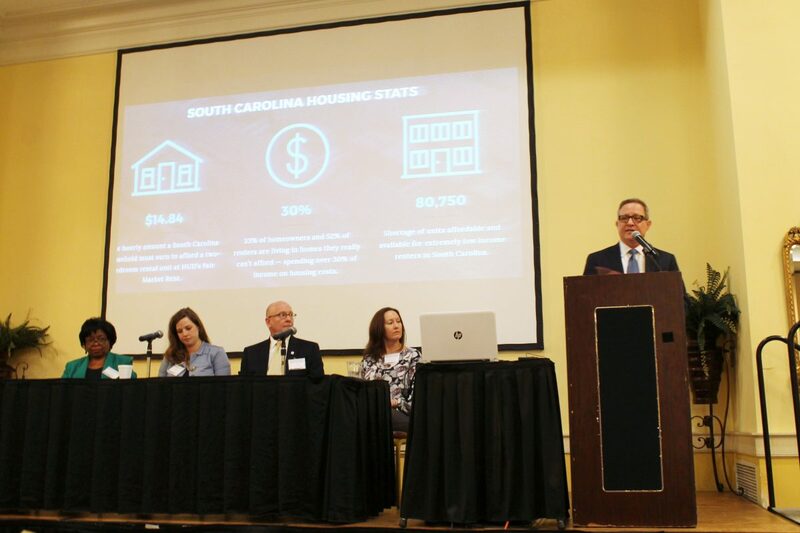 The Housing Policy Summit was a critical step in building a coalition committed to changing the affordable housing landscape in South Carolina. Now, we look forward to taking what we have learned and using it to create action. We are encouraged by the leadership of our speakers and panelists, and motivated by the energy of Housing Policy Summit attendees. Thank you to our sponsors, speakers, panelists, attendees, and Brookland Banquet and Conference Center for a successful and inspiring summit. View photos from the SC Housing Policy Summit here. To stay up to date on the SC affordable housing discussion, subscribe to our Housing Matters newsletter.